There are faucets for the sinks, shower and bath tub (or a combination Tub & Shower). And the manufacturer that created all these also can produce the tank lever for the toilet and all the bathroom accessories. That's a lot of bathroom faucets! Tubz.com has a large selection of beautiful, high quality bathroom faucets all on sale. 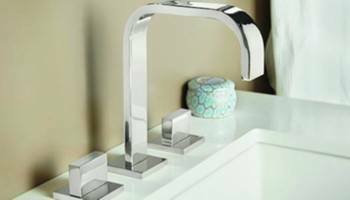 Faucets come in a variety of styles and finishes to coordinate with your bathroom sink. It is best to choose your sink first since the sink will often determine the style & size of the faucet needed. 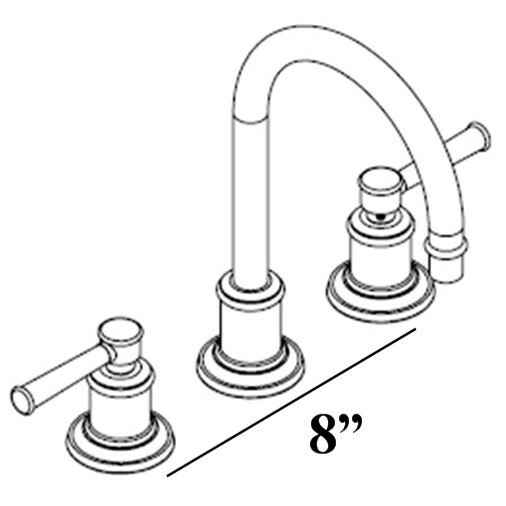 The most popular sink faucet, the 8" widespread requires the center of the outermost holes to be 8" apart. Some widespreads are variable; they can be custom spaced within limits (6" - 12"). The faucet's technical sheet will give all the important measurements. This style is perfect for drop in & undermount sinks, plus pedestal & wall mount sinks that are pre-drilled for this size. From ultra modern to old word traditional, you can find a large range of styles and finishes to fit your bathroom. Most single hole faucets also have a single control. Lift the handle to start the water flow, turn the handle left or right to control the water temperature. A few have two handles, one for hot water and the other for cold. 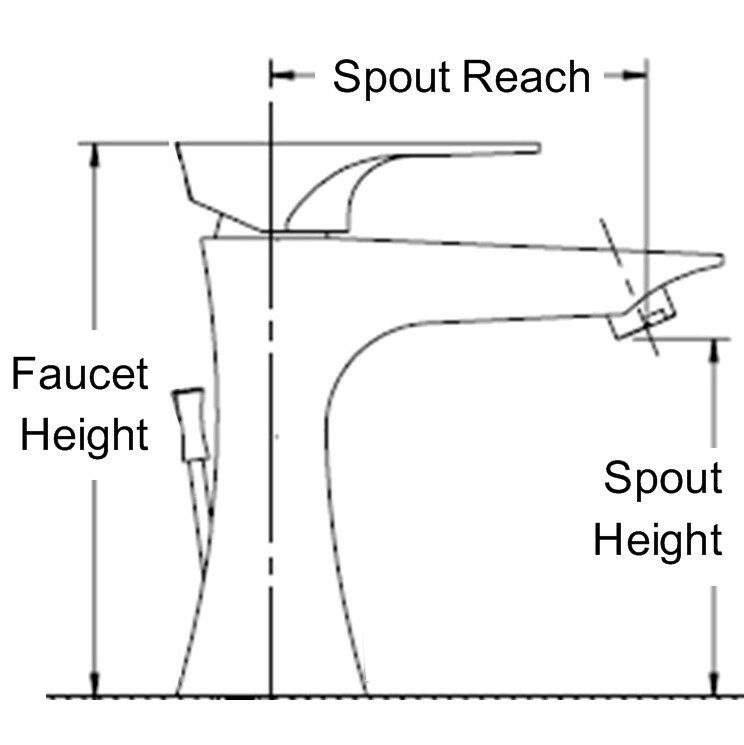 Spout height is the measurement from the counter top to the spout's opening. Spout reach measurement varies between the manufactures. Traditionally it is center to center: center of the faucet base to center of the water stream. Some measure from the front of the faucet to the water stream. Please check the technical information to see how it is measured. There are no hard fast rules on picking the best size. You will want enough room to get your hands comfortably between the bottom of the sink and the spout. The shorter faucets work best with a drop-in or undermount sink of standard depth. Also perfect for a sink with a tap platform. If the sink is shallow, you will want to increase the spout height. 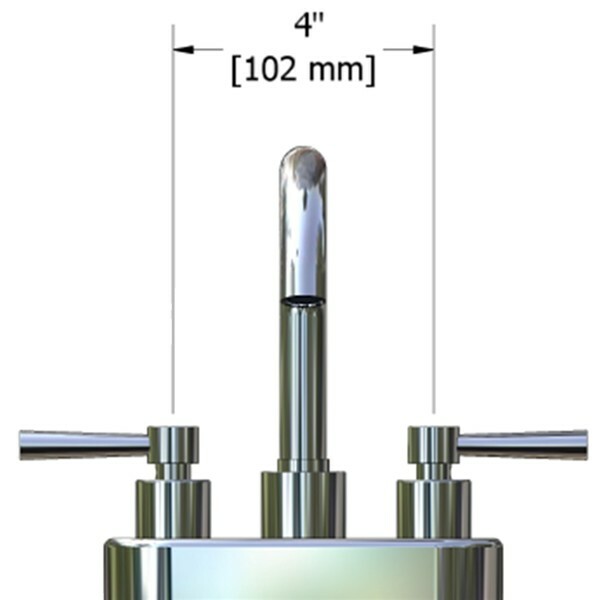 These faucets are specially designed for use with above counter vessel sinks. They are designed to be taller to reach over the rim of the sink. Use single hole faucet information above for faucet measurements. Spout reach becomes more important with vessel sinks. They tend to vary more with the slope of the sink. The more slope, the more you want the water stream to be closer to the drain to prevent splashing. Wall Mount Faucets are perfect when there is limited counter space around the bathroom sink. They are also popular when paired with vessel sinks when a longer spout is necessary. 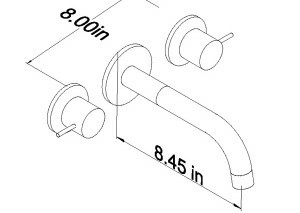 Spout length on a wall mount faucet is measured from the wall to the center of the water stream. 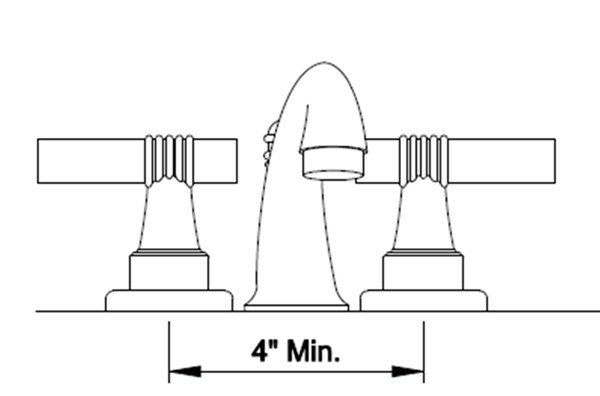 Faucet height is determined by you. As with all faucets, you will want enough room to get your hands comfortably between the bottom of the sink and the spout. These faucets are for use with a sink. Wall mounted tub faucets require a larger valve to fill the tub faster. See wall mount tub faucets. Handles and spout are combined on an integral 6" base. These require the center of the handle holes to be exactly 4" apart. 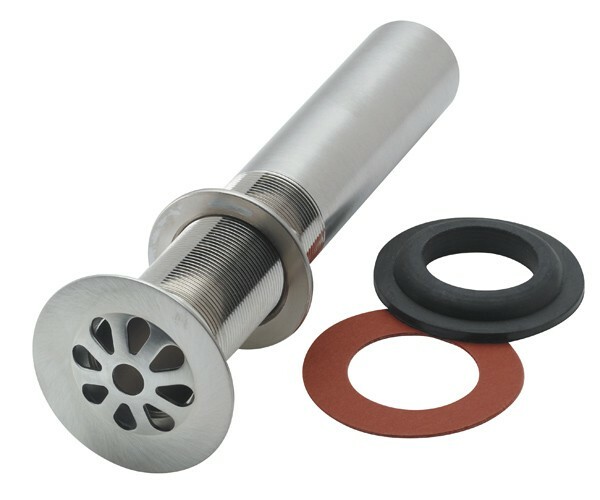 The 4" Centerset is recommended for small sinks and pedestal sinks that are pre-drilled for this size. Looks of a widespread but designed to fit in the same hole requirements as a 4" Centerset. The handles and spout are smaller than the 8" counterpart. Some Mini Widespreads are variable, they can be custom spaced from 4" to 8". Many sink faucets come with a drain. 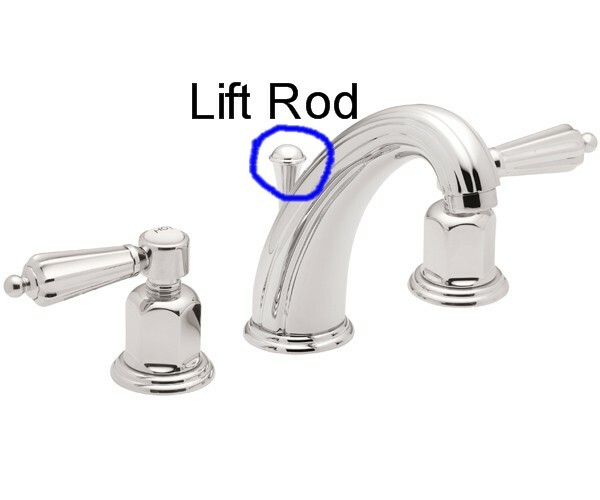 Most styles will have a lift-rod pop-up drain. Pull the knob, usually behind the spout to open the drain, push down to close. Some modern faucets may have a push drain, or the option of one. The drain is opened and closed by pushing on the drain cover at the bottom of the sink. Wall and vessel sink faucets most likely will not have a drain included. The style of sink defines the drain needed. 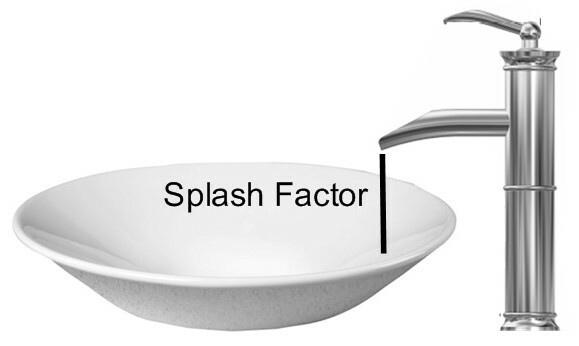 The sink may be designed with an overflow: a hole in the side of the sink so if water was left running, the water will flow down the inside of the sink and out the drain. If they don't have one, then codes state that the drain used with the sink needs to always be open. That way there is no chance of overflowing the sink. The grid drain pictured below always lets water through. Choose your tub first, then you will know the style of filler you can use. No matter the style used, an important measurement is the spout reach. Make sure the length of the spout is sufficient enough to clear the rim of the tub but not too long to be in the way of a bather. If the faucet is going to be on the tub surround or on the floor, spout height is also important. The spout should comfortably clear the rim of the tub. Also take a look at the flow rate; if a faucet fills at 6 gpm (gallons per minute) and your bath holds 120 gallons - expect 20 minutes of fill time. Change it to 15 gpm and the fill time is cut to 8 minutes. With the manufacturers we carry you can create a custom shower to meet all your needs. It can be a simple tub & shower set or a spa shower with multiple shower heads, handheld shower, body jets or with a waterfall. Since the possibilities are endless and the the information we would like to share is vast - we have a dedicated page. Remodel your bathroom with style and without breaking the budget with faucets from Tubz.com.